For '00-'06 Scarabeo 50 OEM Parts Diagrams Click Here! For '95-'04 Rally 50 OEM Parts Diagrams Click Here! Aprilia Accessories Easy Size deco leather -#8792002 For '99-'05 Scarabeo 50 carb, and Scarabeo 50 Ditech. OEM Aprilia Top Box Basic Brown for '99-'05 Scarabeo 50 Carb. 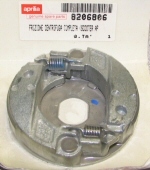 Genuine Aprilia Front Brake Caliper for all '98-'04 Scarabeo 50. 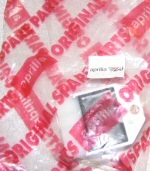 OEM Aprilia CDI module for '95-'04 Rally 50, '99-'05 Scarabeo 50, and '97-'00 SR50. Genuine Aprilia centrifugal clutch assemgbly for '99 Scarabeo 50. Top Performances D47 Replacement Piston With heat treatment. For Pink colored Top Performance Big Bore Cylinders used on '98-'05 Scarabeo 50 Carb, and '97-'00 SR50 Carb. 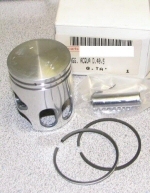 Top Performances D47.4 Replacement Piston With heat treatment. For Pink colored Top Performance Big Bore Cylinders used on '98-'05 Scarabeo 50 Carb, and '97-'00 SR50 Carb. Genuine Aprilia Lockset for '98-'04 Scarabeo 50. This kit includes ignition, seat latch, and accessory compartment lock. Genuine Aprilia front brake lever (mounts to right handlebar) for '98-'04 Scarabeo 50, and '95-'04 Rally 50. Genuine Aprilia voltage regulator for '97-'01 SR50 (carbureted), '96-'04 Rally 50, and '98-'04 Scarabeo 50 2T. OEM Aprilia Chrome Accent Kit For '99-'05 Scarabeo 50 Carb. Genuine Aprilia Clutch Housing for '95-'04 Rally 50 and '98-'99 Scarabeo 50. Genuine Aprilia drive belt for '95-'04 Rally 50, '98-'04 Scarabeo 50, and '97-'00 SR 50. OEM Aprilia Heavy Duty Scooter Cover - #9830101 If you have to park your scooter outdoors you need this cover! The Michelin Reggae 130/90-10 is an excellent knobby tread dual purpose tire for the rear of the Aprilia Rally, Yamaha Zuma, and Genuine RoughHouse 50. Genuine Aprilia crankcase oil seal set for '95-'04 Rally 50, '99-'04 Scarabeo 50, and '97-'00 SR50. The Michelin Reggae 120/90-10 is an excellent knobby tread dual purpose tire for the front of the Aprilia Rally, Yamaha Zuma, and Genuine RoughHouse 50. OEM Aprilia Piston ring set D40 -#8206120 For '98-'05 Scarabeo 50 Carb, '97-'00 SR50 Carb, and '95-'04 Rally 50. OEM Aprilia Rear Brake Lever -#8118461 For '98-'05 Scarabeo 50 carb, and '01-'04 Scarabeo 50 Ditech. Genuine Aprilia saddle lock with two keys for, SR50 "97-'00, Pegaso '97-'00, '98-'04 Scarabeo. YUASA YB4-LB battery for '99-'05 RS50, '95-'03 RS250, '97-'00 SR50 Carb, '99-'05 Mojito 50, and '00-'04 SR50 Ditech. OEM Aprilia Piston ring set D40,5 -#8206220 For '98-'05 Scarabeo 50 Carb, '97-'00 SR50 Carb, and '95-'04 Rally 50. OEM Aprilia Rear Brake Shoes & Springs -8213133 For '05-'054 Rally 50; '98-'05 Scarabeo 50 2T Carb. OEM Aprilia Oil Seal -#8206212 For '97-'00 SR50 Carb, '98-'05 Scarabeo 50 Carb, '95-'04 Rally 50. 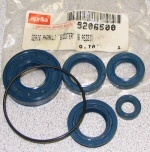 OEM Aprilia Carburetor Gasket/O-Ring Set - AP8206886 For '97-'01 SR50 Carb, '99-'05 Scarabeo 50, '96-'04 Rally 50. This brand new genuine Aprilia left front turn indicator is a direct replacement for '97-'04 Pegaso 650, and '95-'04 Rally 50 Aircooled. This brand new genuine Aprilia right front turn indicator is a direct replacement for '97-'04 Pegaso 650, and '95-'04 Rally 50 Aircooled. Genuine Aprilia engine stop switch for '97-'00 SR50, '95-'04 Rally 50, and '99-'03 Mojito 50. USA Version.